We are going to build an hot air balloon of used plastic bags. The balloon goes in the air at this year's Roskilde Festival. At this year's festival you can look forward to Museo aero solar, a flying museum in the shape of a huge solar-heated balloon made ​​entirely of recycled plastic bags. It is a do-it-together project that explores new ways of thinking energy and space. In three simple maneuvers plastic bags are cut, pasted and decorated into a giant balloon that can float only with help from the heat of the sun. The construction of the big balloon starts at the National Gallery of Denmark on 21-22 May when all Roskilde-goers are invited to a workshop. The event is free. Just bring all your used plastic bags. 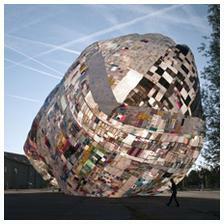 The project was initiated by Argentinian artist Tomas Saraceno. In the cross field of art, science and architecture, Saraceno presents visions of the solution to humanity's social and environmental problems using alternative, sustainable patterns of living in the skies above us. During the festival's warm-up days (June 26-29) you are invited to Art City at Agora M where the balloon will be finished. The balloon is launched during the festival every morning at sunrise from 30 June to 3 July. One hour before sunrise the balloon is spread out on the ground and filled with air from large ventilators. When the sun rises, the air inside the balloon is heated and it goes upwards. Museo aero solar is presented by the National Gallery of Denmark.